The MCM class design incorporates modern mine countermeasure technology into a specially designed platform which includes low magnetic signature diesel engines, a precise electronic navigation system, a mine hunting and classification sonar, and a mine neutralization system. The MCM mission is to clear bottom mines and moored mines in coastal and offshore areas. Production of the ARDENT is underscored by an extensive array of tests for shock, noise, vibration and magnetic signature. As a product of dedicated efforts and resources, these ships fulfill an important role in the long standing objective to maintain the nations mine countermeasure capability. ARDENTS hull structure is comprised of a combination of various types of wood including Douglas Fir, White Oak, and Alaskan Cedar. Both the ships hull and superstructure are fabricated of all wood construction, with a glass reinforced plastic (GRP) fiberglass covering over all exterior surfaces. She is 224 feet long, 39 feet wide and has a 12 foot draft. She is powered by four Isotta Franchini Main propulsion diesels rated at 600 BHP each and uses three Isotta Franchini diesel generators for ship electrical service. ARDENT has been outfitted with state of the art minehunting sonar and mine neutralization systems as well as various mechanical and acoustical mine sweeping gear. She is manned by 8 officers, 6 chiefs and 70 enlisted. The keel of the third ship to bear the name of ARDENT was laid on 22 October 1990 by Peterson Builders Inc. 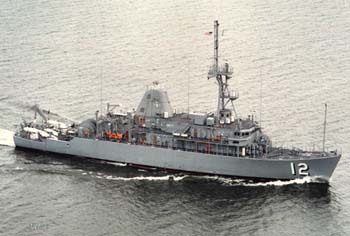 Launched on 16 November 1991, ARDENT was sponsored by the First Lady of Wisconsin and subsequently commissioned into active service without ceremony on August 20th, 1993. Her maiden voyage commenced on October 30th, 1993, and included a unique transit through the Great Lakes and St. Lawrence Seaway. The trip was punctuated by the arrival of ARDENT to her homeport of Ingleside, Texas on December 15th, 1993. Formal Commissioning ceremonies were held on February 18th, 1994 in Ingleside. ARDENT was forward deployed to Manama, Bahrain in the Arabian Gulf region and manned by MCM ROTATIONAL CREWS. On March 1st, 2000, ARDENT made Bahrain her permanent homeport with MCM ROTATIONAL CREW CHARLIE as her nucleus, becoming the first U.S. Navy ship to be homeported in the Arabian Gulf region.